Ardam: I wonder how a species that explodes at the first sign of trouble managed to not make itself extinct. Drecker: If you were a predator, would you go after Bombats? So, the heroes have been cornered by The Dragon, and they seem locked in a fight which will kill them all. Unless they get a massive amount of fatal damage in soon, they're screwed— whoops, there goes Joe, blowing himself up right on the enemy and positively obliterating him. That crazy shmuck! An Action Bomb is anybody or anything which tends to use "Blowing Myself Up" as a combat technique. Though it kills the user, this is actually a logical tactic for those willing to expend their lives; the more accurate an explosive device is, the more likely it is to accomplish its goal, and how much closer do you get than right next to the target? A common variation is the enemy that won't commit suicide (other than trying to attack you in the first place), but will detonate violently upon death (see Last Ditch Move and Dead Man's Switch). If the user is expendable enough, he'll die. If the user is special or a hero, expect to see him either have it as a Dangerous Forbidden Technique that will one day get him Killed Off for Real, or resurrected and re-deployed ad infinitum. See also Having a Blast, Mad Bomber, Taking You with Me and Why Am I Ticking?. The Church of Drowning in God's Grace from Book of Bantorra have the tendency to turn their "meats" (brainwashed slaves) into living bombs by implanting the bombs in their chest. In Cyborg 009, three teenagers get bombs implanted in them and are given the mission of killing someone they know and love: the eponymous Cyborg, Joe/009. Also, in the older TV series Albert/004 has a nuclear bomb stored in his stomach. And in the 80's movies, he does use it to save his teammates. He manages to survive, though. Daimos: Episode ten featured a Mecha Soldier designed to latch on Daimos and detonate the nuke built in its body. Dance in the Vampire Bund has vampires pull creative twists on this twice so far. One reporter secretly involved in a conspiracy has herself turned so she can cut herself open and sew a sizable block of C4 in her abdomen before attending a press conference given by Mina Tepes. In an apparently seperate case an agent of a rival vampire clan implants vials containing a chemical that reacts explosively with the blood of vampires and rigged to rupture with a cell-phone signal inside the bodies of numerous minions, and tries to blackmail Mina by dispersing them within the Tokyo subway system. Chiaotzu. Vegeta and Cell also tried exploding to defeat their enemies at least once (resulting in a huge Tear Jerker for the former), and Cell actually killed Goku doing it. Most, if not all, of Dr. Gero's Androids incorporated very powerful self-destruct devices. 17 and 18's are removed by Shenron on a wish from Krillin, (which is used as a plot point in GT because 17 was not made aware of that fact,) while 16's is removed by Bulma. The problem is that she doesn't make him aware of that either, so 16 attempted to use his nonfunctioning self-destruct mechanism against Cell. When it failed, Cell kills him, not that the bomb would've helped anyway according to him. The Saibamen used by Nappa and Vegeta in the Saiyan saga, which infamously managed to kill Yamcha long before the other Z Fighters even took on Nappa. In Fullmetal Alchemist, Fu tries to commit a Heroic Sacrifice by jumping at Wrath while covered in lit dynamite. The explosives never go off, but he dies nonetheless. Musashi has been immortalized for this as part of his various Heroic Sacrifices. Played straight in the original manga and Shin Getter Robo VS. Neo Getter Robo, in which Musashi, completely overpowered by his enemies, decided to take them with him by crushing the extremely volatile energy reactor of his Humongous Mecha. In Happiness, Koyuki's Sphere Toms have the ability to blow themselves up, which they use several times over the course of the series. In Hunter × Hunter this was Netero's trump card against the Chimera Ant King. By stopping his own heart after all of his other efforts barely scratched the King, he activated the extremely powerful bomb implanted in his body. It very nearly worked too. Mazinger Z: Mechanical Beast Aeros B3 was designed to plunge into the Mount Fuji's crater and blow himself up in order to set off an eruption and bury the Photon Atomic Energy Research Institute. Yasu "The Weasel" from Shin Mazinger has a literal bomb in his stomach to be used only when the situation is otherwise hopeless. Quatre Winner's Sandrock Gundam from Mobile Suit Gundam Wing. It sacrifices itself while letting Quatre escape to safety. Zig-Zagged in Naruto: Deidara's weapon of choice are self-made explosives. When cornered by the heroes he claims to explode himself but what he actually does is detonate an explosive clone. Later Deidara does however use his self-destruction technique. He is then revived by Tobi's Impure World Resurrection technique. Suddenly he has an infinite amount of chakra and his body pulls itself together automatically. Even though he even lampshades himself the fact that he could use his self-destruction technique as many times as he wants, he doesn't do this because it would decrease the value of his "ultimate art". Deidara also turns a few mooks into bombs by booby-trapping them with his explosives. In Ninja Scroll, Zakuro is a sadistic explosives expert who specialises in setting explosive traps to kill her enemies... including using living creatures as disguises for her bombs. She turns a mutilated captive ninja into one of these in her first battle, then kills Yurimaru with a setup involving a rigged warehouse and a small explosive sewn into a living rat. She ends up being used as one herself (sadly, she didn't realize that carrying a large amount of potent, powerful explosives at all times can be a liability if those explosives are highly flammable) seeing as the Cool Old Guy managed to distract her and use her to blow a hole in the hull of the ship. In One Piece, Mister 5 of Baroque Works has a Devil Fruit power that lets him use any part of his body as an explosive. From his leg to his boogers, to his breath. Late in a battle with the Straw Hats, he grabs Usopp and attempts to obliterate the guy with a "full-body explosion". Unlike most examples, Mister 5's powers also come with immunity to explosive force, meaning that he can blow himself up repeatedly without actual harm to himself. Shana and Alastor in Shakugan no Shana do this to end the first season in a Dangerous Forbidden Technique version, although she thought it was a certain fatality when she did it. In Soul Eater while battling the Kishin's forces on the moon the desk receptionist for Shibusen manages to temporarily stop Kagura by leaping inside her defensive shield while it regenerates and setting off an entire bag of bombs. Both survive the explosion, however. The Marriage in StrikerS Sound Stage X are composed of some sort of material that allow them to turn their arms into weapons. This same material can be converted into a powerful liquid explosive and detonated by the Mariage at a thought, letting them perform a final attempt at their enemies' life should they somehow be captured alive. Jo Jos Bizarre Adventure Diamond Is Unbreakable has Sheer Heart Attack, a sub-stand of Killer Queen. It's a small vaguely turtle-shaped object on tank treads which follows heat sources and explodes whenever it makes physical contact with one. which becomes much more complicated when one of them turns out to be a Lex Luthor-designed living bomb. When Superman comes to dispose of the Action Bomb, it responds with the supremely absurd line "The purpose of my existence is to explode! You have no right to limit my ambitions, fascist!" Grant Emerson alias Damage (member of Teen Titans and JSA) has the superpower (coupled this with enhanced physical abilities) to take the energy that he generates to detonate himself like a bomb. This power is the most dangerous of the abilities he possesses and also the most tied to his emotional state and the most likely to lose control. Used as a joke in an issue of Legion of Super-Heroes. Tryouts. Next applicant: X-Bomb Betty. "I can create an explosion of 150 million megatons." Rejected for having a power that can only be used once. For comparison, the Chicxulub impact was a "mere" 100 million megatons, and The Tunguska Event is estimated at no more than 30 megatons. A blast of 150 million megatons is approaching biosphere killer. There's two DC characters called The Human Bomb, whose superpower is exactly what you'd expect. He is a super-hero who generates massive explosions, usually a member of the Freedom Fighters. This dangerous condition requires him to constantly wear a containment suit. The premier superteam of the USSR, the People's Heroes, featured Molotov, a heavyset man who could make himself go kaboomski and reform sooner or later depending on the magnitude of the 'splosion. Frag, of DC's Blasters, who haven't been seen much lately. One of these was present when Judomaster was introduced to the Justice Society of America title, working as a Yakuza super-assassin. Built like a sumo wrestler, called himself Kamikaze, and self-detonated by shouting "Banzai!". Set up the loophole to her Nigh-Invulnerability powers - only direct attacks against her are deflected - then probably never showed up again. The solar flare is a new power that Superman developed in the New 52. As of Superman (vol. 3) #38, he has the power to cause a massive explosion of concentrated solar energy, incinerating everything within a quarter of a mile. According to Batman, his heat vision was just a precursor to his new ability. The drawback, however, is that the explosion depletes all the solar energy in his cells, rendering him human for the next 24 hours. Superman's cousin Supergirl can release the solar energy within her as an explosion without harming herself. In Red Daughter of Krypton She used this ability to knock down Worldkiller-1. The supervillains Shrapnel and Frag (who tend to be Jobbers rather being a member of any particular hero's Rogues Gallery) both have the ability to explode and scatter their metallic bodies like shrapnel before reforming. Frag was actually created as a Suspiciously Similar Substitute for Shrapnel during a period when Shrapnel was supposed to be dead. Nitro is a B-list exploding villain who can go off as many times as he wants, exploding into atoms and then reforming. He's best known (in universe) for killing the alien Captain Marvel (not to be confused with that one), and for kicking off the events leading to the Civil War by blowing up six hundred people in Stamford, Connecticut. Marvel also had z-lister Powderkeg, a mutant baddie who sweated nitro-glycerin. Rockslide of the New X-men turns out to have the power to self-explode and reform himself. One of the Dirty Pair comics had bioengineered exploding chihuahuas. Fred Perry's Gold Digger has the Peebos, which originated as artificially intelligent robot bombs before developing into a group Robot Buddy for the series. Brianna would later install a system that flash-downloads their A.I. into a replacement body when they go off, allowing them to blow themselves up to their hearts content without sacrificing themselves. The Heroic Sacrifice of Rex Splode in the one-issue summer blockbuster crossover "The Invincible War''. One of the first villains Mark ever faced was a disgruntled teacher abducting students and turning them into walking bombs. Only one of his victims is still alive, and while he's no longer volatile his torso is still metal and wires. In When There Was A Tomorrow: The Covenant-Reaper alliance has turned out Grunts husks called Gremlins, which run at and suicide bombs their enemies. The Pokémon fanfic Pickles and Depredation has an Eevee that learns the move Self-Destruct, allowing it to detonate like a demolition bomb at will. Ladies and gentleman, a "ponified" bomb . Apparently she follows Cartoon Physics when she explodes, though, as the last time she did she "almost did as much damage as Rainbow Dash at the Weather Factory". The Discworld fic by A.A. Pessimal, Hyperemesis Gravidarum , has an explosives-minded Assassin giving creative thought to Agatean Fireclay, and reflecting that a golem made of explosive clay, with a suitably written suicide-chem in its head directing it to the location of the client, would be an elegant weapon for inhumation. Lord Vetinari advises her to turn her mind to less dangerous lines of philosophical reflection. She also reflects that Adora Belle Dearheart would have words to say to an Assassin seeing golems as disposable weapons, and decides it's safer to shelve the idea. In The Lord of the Rings The Two Towers, during the battle at Helms Deep the Uruk-Hai set a bomb in the drainage tunnel at Helm's Deep, with an Uruk with a torch blowing himself up to set it off. Russel Casse in Independence Day: "Hello boys! I'm baaaaaaack!" Robert Neville in the theatrical ending of I Am Legend. Dr. Strangelove, in the famous scene where Major T J Kong rides the nuke down to its destination below, thereby causing the Soviets' doomsday device to detonate and end the world. In Armageddon Harry Stamper manually detonates the nuclear bomb, sacrificing himself to save the world. In Iron Man 3 the Extremis soldiers' Power Incontinence is used to turn them into living bombs. Tony also activates the self destruct on some of his automated armors to take out Extremis users in the Final Battle. In The Dark Knight Joker, while imprisoned, requests 'his one phone call' multiple times. When he's finally granted it, it turns out that the number he intended to call connected to a cell phone set to trigger a bomb implanted in one of his henchmen several cells down, allowing him to escape. In the later Flinx and Pip novels of Alan Dean Foster's Humanx Commonwealth series, the eponymous hero has learned how to deliberately trigger the Super-Power Meltdown of his Psychic Powers and uses it intentionally to escape tricky situations, since he knows it won't hurt him or anyone he really cares about. It doesn't always work, something he remains frustratingly Genre Blind about. Lidia Leoni decided that she had a long life and she rather go out fighting for the Resistance than waiting for old age or a stray bomb to kill her. In T.J. Bass's The Godwhale, the character Drum has an explosive planted in him during surgery, then is sent to a rebel group as a "diplomat" by the world government. It's discovered and temporarily defused, but will detonate at any attempt at removal and kill him if left alone. Drum goes back home and pulls a Self-Sacrifice Scheme... right next to a major reactor. The destruction isn't that widespread, but it's enough for the schemers to reconsider their plans. John Varley's science fiction short story "Bagatelle" is about a lunar police officer dealing with someone who has had an atomic bomb implanted in his body, and warns everyone that he will explode in a set period of time. In Wind And Sparks some necromancers like creating "fishes". It is a walking corpse covered by small scale-like pieces of metal, hence the name. It walks to a group of people and explodes, killing them with shrapnel. What's worse, when a powerful necromancer dies, "the breath of Abyss" starts raising nearby dead and some of them spontaneously become "fishes". It the conclusion to Christopher Paolini's Inheritance Cycle, Glaedr mentions that during the fall of the dragon riders, a Rider who lost his dragon converted the matter in his body to energy, producing what's heavily implied to be a nuclear blast. Galbatorix does the same thing in the book's climax when Eragon forces him to have a Villainous BSoD. In John Steakley's Armor, if a Space Marine flips all the switches in his Powered Armor to "On," the safety features are overloaded and it goes Prompt-Supercritical. This is used twice. Stargate SG-1. In "Singularity" SG-1 rescues a small girl who turns out to have had an inoperable Naqahdah bomb put in her by Nirrti to destroy the SGC. Ultimately the girl is given to the care of Dr. Janet Fraiser, the SGC physician, after they discover that the bomb will dissolve if she is kept away from the Stargate. Star Trek: Voyager. In "Basics" the crew of Voyager pick up a wounded Kazon who unfortunately turns out to have been chemically altered to become a suicide bomb. Unfortunately for Voyager, it came off as a weak copy of TNG episode 81, "Reunion", which used largely the same stunt. Enterprise featured a group of Scary Dogmatic Aliens on board, who...well...you can guess from the trope name. In Lexx, the state of the art in both spaceships and bombs consists of semi-sentient, biomechanical insects. Played with in Heroes, where anyone with the nuclear explosion ability will survive their own explosions. Not so much for everyone around them. Dave Lister's suggested method of dealing with a Polymorph (in the Red Dwarf episode Polymorph. natch) was "why don't we go down to the armory, get a nuclear warhead and strap it to my head. I'll nut the Smegger to oblivion!". this after said creature had drained all his fear. Choujuu Sentai Liveman: Arashi Busujima, being reverted back to his old self, straps dynamite onto himself and charges to the incredibly tough Monster of the Week. All while being fired at. He runs the whole way and successfully makes it, killing both of them. One of Ultraman Taro's most powerful abilities is the Ultra Dynamite, a Finishing Move in which he sets himself aflame and grabs his foe before exploding and annihilating them. Unlike most examples though, Taro reforms shortly afterwards albeit with a great deal of his life energy drained. Ultraman Mebius has a similar ability called the Mebium Dynamite, which he actually learned from Taro. Joe in The Protomen's Act II (accidentally) becomes this to destroy Wily's control tower. It works, but things don't change. Destroy the Godmodder is based in Minecraft, so of course there are creepers. Several larger mechanical entities have had self-destruct abilities. GURPS: Transhuman Space has "Autonomous Kill Vehicles", small ships piloted by sometimes AIs (which may or may not be sapient) or occasionally Ghosts whose main function is to ram enemy ships (since explosives aren't very effective in space). If a suicide attack isn't necessary they're also armed with coilguns though, and if it is most infomorphs have backups. Dungeons & Dragons and Pathfinder monsters, especially in 4th Edition, have the all-too-common feature of exploding upon death, usually doing more than any of their regular attacks would do. Results in many an amusing combat with everyone swarming an enemy for a round or two, then scattering to let the mage kill it with fire from range and watch it go boom. In the 4E Eberron book, there are details about if a PC is infected with Filth Plague, and if it progresses to it's critical state, the infected loses all surges, cannot heal, and when reduced to 0 hit points, explodes and all creatures within a burst 3 contract the Filth Plague. Balors have had this ability since the beginning of the game. Draconians from Dragonlance were notorious for these nasty deaths. A wizard breaking a Staff of the Magi or Staff of Power can invoke this trope, though the damage is technically survivable. Survivable in d20 Modern Urban Arcana if you use Outside-the-Box Tactic. Strap yourself with some C4, cast "Resist energy: Concussion" on yourself, and make some fireworks. If you play your cards right, "Resist energy: Concussion" should absorb the damage you would take, and damage every enemy around you. Brave New World World War II supplement Glory Days. A "Bomber" is a delta who can make his body explode and then reassemble himself. The Japanese perform kamikaze attacks by dropping Bombers on Allied ships. The Tau Empire has an upgrade for battlesuits that allow them to detonate upon losing a melee fight. The Imperial Guard's Demolition Charge borders on this trope. It has a huge blast radius, usually doesn't land exactly where you want it to, and is thrown by HAND. It gets the job done, but its operators rarely collect on their pensions. It's less reliable, but in some editions, a common tactic for walkers against horde armies is to hurl them into big units and hope that the eventual power claw strike penetrates and rolls a 6 on the vehicle damage chart - which results in a massive explosion, hopefully laying waste to the surrounding models. Tyranid Spore Mines are biologically engineered action bombs; being essentially a floating sack filled with caustic and volatile liquid that will explode with the power of a grenade when agitated (you piss it off, it go boom). They can be dropped by larger Tyranid fliers in bombing runs, dropped in larger sacks who's entire purpose is to deliver these, or launched into combat by biovores. Eversor Assassins' playstyle is focused on this; find a target, make a beeline for it, then watch the hilarity. Since Eversors explode on death and they prefer to engage in melee, this means that there will be a high number of enemies clustered around it when it does go off. Though they have not been seen in-game since 3rd Edition (and even then, only through an ancillary set of rules), 40k lore gives us the Catachan Barking Toads, widely considered the most poisonous creatures in the galaxy (and considering their competition in that category, that's saying something). Hailing from the deadly jungle world of Catachan, the toads blow up whenever they feel startled or threatened, spreading virulent toxins over their surroundings. Lesser Catachan Barking Toads explode with the force of an anti-tank shell, killing everything within a several metre radius. They have nothing on their larger cousins, though; the Greater Catachan Barking Toad kills everything within a kilometre when it goes off. Even power armour offers no protection such is the corrosivity and potency of their toxins. A White Dwarf article that gave rules for the Lesser Toad stated that the Greater Toad wasn't appearing because a game containing one would last until the first shot was fired, at which point the entire battlefield would be wiped out. Optional rules for the spinoff Gorkamorka included buggies with explosive rams, under the name "Kamikazee Karts". Similar to, and more reliable than, the walker trick, a player in Warhammer Fantasy 8th Edition can try to cast a spell with more power than their wizard can safely handle, hoping for an "unlucky" miscast surge of violent magical energy. This can be devastating when the wizard is in a unit, and his unit is on the losing end of an engagement. Frequently played for laughs on various Magic: The Gathering cards, such as Mogg Fanatic , Goblin Grenade , and several others. You'll note that both of those cards listed as examples involved goblins. This was not a coincidence. BattleTech has several advanced optional rules allowing for 'Mechs and the occasional other unit to explode for damage if hit the right way or if the pilot decides to self-destruct, all the better to emulate certain dramatic scenes from the novels with. And of course, the Booby Trap piece of equipment will, for a suitable investment in tonnage for explosives and wiring, simply let a unit blow up right on cue. DC Heroes. If the Bomb power is combined with the Self Link power, a character can use it to blow themselves up (and re-form later). Some cards in Star Realms allows the player to scrap (remove a card from their deck) certain ships and bases for additional damage points. Notably, the card Battle Station has this as it's only ability. Nightmares in Pathways into Darkness explode with a small blast radius when killed. The Marathon series had the Simulacrum BOBs. Extra bonus for looking like friendlies., Also, the Lookers. The Game Mod Excalibur: Morgana's Revenge had the exploding Forraje clones, which were basically palette swaps of the original Simulacrums. The Myth series has wights. Halo has the Flood Carrier Forms. And the Suicide Grunts. Really, anything stuck by a plasma grenade instantly becomes this (including other Spartans in multiplayer). The Suicide Grunts are just volunteering. Destiny has Cursed Thralls and Shank Exploders. The Pikmin series has the Volatile Dweevil, which depending on your interpretation is either an exploding spider or a bomb with spider legs. Seeing as Dweevils have a habit of carrying random objects on their backs, it could just be a Dweevil carrying around a bomb rock. Warcraft has Goblin Sappers and Dwarven Demolition Teamsnote their identical counterparts in Warcraft II, who deal great damage to units and incredible damage to structures. Wisps, the Night Elf Worker Units, can also blow themselves up, but this can only damage summoned units (though it also dispels buffs that don't help you). In the Frozen Throne expansion, the Horde get Troll Batriders, which can suicide-bomb enemy air units for massive damage. Warlocks had the spell Hellfire, which was a slow-motion version of this; an AoE fire blast that damaged the warlock in addition to nearby enemies. A couple of quests give you control over a giant zombie that runs around, aggros things, then explodes to kill them. The game also has things that amount to the same as Mario's Bob-Ombs, a cartoon bomb with feet that runs and explodes. You can have a (non-exploding) one as a pet. In the Hoptallus encounter and the gauntlet before it in Mists of Pandaria's Stormstout Brewery, you can encounter virmen (rabbit-like beings) called Hoppers that carry explosives and can blow themselves up. The optimal way of dealing with them is killing the Boppers, picking up their hammers, and using the extra action button to kill them and the Hoplings. In the Commander Vo'jak encounter in the Siege of Niuzao Temple, two of the waves include Sik'thik Demolishers, who carry explosives and try to climb the ramp to reach you. A single hit detonates them. In the Siege of Orgrimmar raid's Iron Juggernaut encounter, the boss will periodically deploy Crawler Mines that must be stomped on by the DPS to prevent raid-wide damage. They reappear in the Siegecrafter Blackfuse encounter targeting random players and explode for massive single-target damage if they reach their target, but must also be disposed of quickly before their break-in period ends and they become immune to crowd control effects. The Pokémon that can learn Selfdestruct or Explosion. These moves, while extremely powerful, cause the Pokemon using them to faint on the spot. Some Pokémon can also possess the Aftermath ability, which damages the foe when knocked out by an attack that makes contact. As for wild Pokémon using such moves, it is said that Electrode (one of the most notorious self-destructers) finds blowing itself up to be hilarious (probably helps that the explosion isn't lethal). Serious Sam has the iconic Beheaded Kamikazes: zombies with cartoon bombs for heads that beeline towards you screaming at the top of their lungs (despite the 'no heads' thing. It's All There in the Manual). The running joke is that Mental could have taken over the universe by now if he had just left them silent. Word of God says the screaming is for psychological warfare. And it's sure as hell effective. Also, the marsh-hoppers. The black bird (Bomb) in Angry Birds. Coupled with the fact that almost all of the birds attack using themselves as projectiles. In Angry Birds 2, the Red Pepper spell causes one pig to "ignite" and explode much like Bomb's power. Super Mario Bros. has an interesting take on this with the Bob-Ombs and Bullet Bills. According to first-wind-up-key accounts, Bob-Ombs enjoy blowing themselves up quite a bit, and think it akin to punching someone in the face. Ironically, their king seems to be the only one who can't do it through sheer force of will. The Paper Mario games are the first games where they're shown to be capable of repeatedly blowing themselves up with no ill effects save for occasionally being launched a couple dozen feet in the air (Taken to an extreme by a squad of them who operate a cannon by cramming themselves into it and exploding simultaneously). This only applies to the friendly Bob-ombs, however, as once a hostile one explodes in battle, it's down for the count. However, in Mario & Luigi: Paper Jam their king Took a Level in Badass and can explode after a five minute timer. Yes, this is a real five minute timer in a turn-based game. It is almost impossible to survive his explosion, making his battle a Timed Mission. While Super Smash Bros. has the Bob-ombs as items, there is also the Subspace Emissary enemy "Bombed". Their heads are bombs, and to attack, they rip of their heads, throw them at the player, and run away. The head regrows after some time, which is when they attack again. If one attacks them while they have a head, it will fall off and explode. Every game in the series has also featured the aforementioned Electrode using Self-Destruct, as either a stage hazard in the Saffron City stage, or summonable via Poké Ball. Ultimate also introduces the below mentioned Bomber as an item. Additionally, one of Galeem's attacks has him create a copy of a playable character made of pure light that chase and attack the player to explode after a few seconds. Dharkon uses a version of this attack, only his copies are made of darkness. The spell Kamikazee, which has the added bonus of instant-killing all non-boss enemies with no damage to allies. Either Imps or Minidemons always attempt to use it, but due to their woefully inadequate MP, they fail every time. 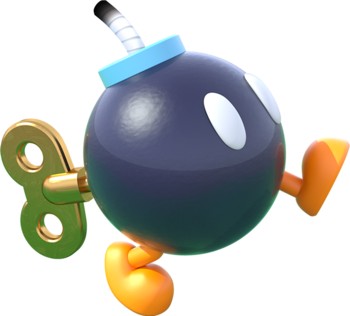 The Rockbomb enemies also self-destruct as a very rare technique, (hence the name). There's even an item in some games called a Kamikazee bracer that blows the user up when they die and kills all opposing enemies. In Dragon Quest II, the spell Sacrifice essentially performs this role, killing the user in exchange for instantly killing all opponents with 100% success. There are three problems, however; first, the only member of your party that can learn this spell is also the only one who can revive killed allies, so killing him means you must either find a priest (or World Leaf, of which there is only one) to get him back, or continue without him, which is a death sentence in most cases. The second problem is that some enemies can cast this, and if they do, your entire party is killed instantly every time. Do not pass GO, do not collect $200, you are DEAD. Three, it actually doesn't work on the boss enemies it would be most helpful against. Dragon's Dogma has Stout Undead, fat zombies that swell up and explode when lit on fire, potentially eliminating some of your enemies, or doing damage to your party in close quarters. In Thief: Deadly Shadows, Viktoria blows herself up in a massive explosion of rapid plant growth, in order to help Garrett take down Karras by performing a Hoist by His Own Petard on him. In The Legend of Zelda: Majora's Mask, Link can use the "blast mask" to create an explosion right in front of his face. This can hurt, but the damage can be blocked by putting the shield in front of his facenote No, we don't know how that works. There are also rat-like enemies who have bombs strapped to the ends of their tails, and explode upon touching Link. In-universe, this inspired an invention called a "bombchu", (also found in Ocarina of Time) which is a sort of bomb modeled after these rats, which hovers over the ground like a heat-seeking missile. Eternal Darkness: Ulyaoth has a dependence for this trope, if his singing zombies are of any proof. Some bosses in the Donkey Kong Country series can invoke living, explosive creatures. In Donkey Kong Country Returns, Stu can release a wood-shielded living mine that will slowly follow Donkey and Diddy. In Donkey Kong 64, Puftoss will release speedy Puftups that will chase Lanky until hitting him, or until exploding due to tiem running out. 64 also inverts the trope in one sidequest: A rabbit is tied to a crate of explosives, and several living flames will walk onto him to make him explode; the objective is to prevent this during a time limit. Also, some normal enemies do that too. Like Puftup and Kaboom in Donkey Kong Country 2: Diddy's Kong Quest and Klasp, an Expy of the latter in Donkey Kong Country 3: Dixie Kong's Double Trouble!. The Propeller Bombs in Kirby's Dream Land 2 are normally virtually harmless, being completely immobile and easily destroyed like any other enemy. If one of Kirby's animal friends approaches them, however, they'll put on a wicked expression and start pursuing them, dealing a One-Hit Kill if they manage to make contact with them. They also take a lot more effort to destroy in this state, requiring multiple hits from any ability other then Ice before they explode, and can't be inhaled, either. They reappear in some future games, but are a lot more basic, simply pursuing Kirby the moment they appear onscreen, but lacking the other dangerous qualities. Crash. Crash basically nukes the screen when used, annihilating anything that isn't a Boss (even most sub-bosses will kick the bucket when this ability is invoked, but if the boss doesn't die it will be close to death anyway). The Ice + Bomb ability in Kirby 64: The Crystal Shards turns Kirby into a walking snowman with a lit Cartoon Bomb for a hat. Later Call of Duty games feature multiplayer modes featuring the "Martyrdom" perk. When the player dies frequently enough, they get to drop a live hand grenade. Woe unto the melee attacker who sticks around after making that kill. Also some Spec Ops survival modes feature Bomb Dogs, which are dogs wearing suicide bomb vests. Devil May Cry has the Wrath Mook. Particularly dangerous in heaven or hell mode. Disgaea (and most games where Prinnies appear): Prinnies dood! They explode when thrown, and can also do it of their own accord with their "Prinny Forever" attack in Disgaea 3, though it just leaves them with critical health in that case. Thursday's "Arigato Roboto" functions in a similar fashion.. Disgaea 2: Cursed Memories—Goodbye Tink: Tink sacrifices himself] but nobody cares. In the "Kingdom Come" mission in Grand Theft Auto III, the player is ambushed by "Spanked Up Madmen" spawning from mook-making vans, who behave much like the Simulacrums in Marathon, complete with weird random chatter such as "Come to daddy"! "I got a present for you!" etc. In .hack//G.U. series there's a type of monster with shell hats. Nearly all the monsters in this group have an attack where they go cover themselves with their shell and then explode. Almost every single one of the Heaven Smiles in killer7 does this, to the point that they have no other means of self-defense than blowing themselves up when they get close enough to the player. The only ones who don't have this as a primary means of attack are the Laser Smiles, Galactic Tomahawk Smile, and some of the bosses, though the latter two will explode if oyu get too close. Half-Life 2: Episode One introduces the "Zombine" enemies (combine troops taken over by headcrabs). They can use grenades but not throw them, meaning that they will essentially commit suicide when using them by rushing at the player with one in their hand (although it is possible to use the gravity gun to "steal" the grenade and get rid of it before it explodes, or to run like hell and let them blow themselves and the rest o of the zombies to bits). The Command & Conquer series features many of these. In Command & Conquer: Red Alert: The Aftermath there are Demolition Trucks that detonate in nuclear explosions. They are stated by be driven by computers in the manuals but have normal human move sounds (arguable the manuals had that thrown in for censorship). The Soviets have the MAD Tanks that self-destructs in a large shock waves damaging vehicles and structures in a large area. Command & Conquer: Tiberian Sun has Hunter-Seeker robots that latch onto opponents and explode. They're also as dumb as a box of rocks, picking their targets entirely at random. Sometimes they'll One-Hit Kill something really expensive or important... other times they'll go after a random soldier off in the corner of the map. Command & Conquer: Red Alert 2 sees the return of the Demolition Truck for the Soviets (for Libya at least), now driven by a human, and the Terrorist for Cuba who is a suicide bomber. Crazy Ivans can plant bombs on friendly units to make the suicide bombers. It is a popular tactic online to use these on Attack Dogs. In Command & Conquer: Generals the GLA also have a Terrorist and the Bomb Truck. The GLA also build Demo Traps that self-destruct when enemies go near, or can be set to detonate when ordered. In Generals: Zero Hour the GLA Fake Buildings can explode to damage nearby enemies. The demolition GLA subfaction can also purchase the "Demolition Upgrade" allowing all units and base defenses to self-destruct. This same subfaction also replaced the Demo Trap with the more lethal Advanced Demo Trap and has even more powerful Terrorist, and their Combat Cycles come mounted with suicide bombers. In Command & Conquer 3: Tiberium Wars Nod has the Fanatics, who are groups of suicide bombers. In Command & Conquer: Red Alert 3 the Empire of the Rising Sun has the Yari Minisub can kamikaze into other ships and Burst Drones that attach to enemy vehicles and explode. The Empire has the Honorable Discharge Top Secret Protocol which makes units explode when destroyed. The Empire also has the Final Squadron (X\Omega) Protocols that call in planes to kamikaze targets. The Soviets have the Corrosion Protocol that sacrifices a unit to spread toxins and the Terror Drone Surprise Upgrade Protocol that causes Terror Drones to emerge from destroyed vehicles. In Command & Conquer 4: Tiberian Twilight Viseroids self-destruct for their attack. Viseroids can only be obtained by capturing a tech building. Bombs of all games where they appear have this as their signature ability. Rydia in Final Fantasy IV can obtain the Bomb summon via rare drop. Final Fantasy VIII has the ability Kamikaze. Which is one of three attacks that can break the game's 9999 damage cap, the others being the GF Eden and Quistis' Shockwave Pulsar. However, unlike Self-Destruct, Kamikaze removes the using character from the battle entirely and you can't just use a Phoenix Down to get him/her back. Also, Cid from Final Fantasy IV detonated a handheld bomb to collapse a mountain on top of the enemy airship pursuing the party. He got better. The two-hour ability of the Ninja job in Final Fantasy XI, Mijin Gakure, does this. Given that the player's death in this situation does not cause any experience loss (whereas almost any other cause of death will), it is most often used as a quick method of travel back to one's home point. Shining Force 2 has a battle where there are concealed rock bombs, that act like enemies, and when they are killed they destruct. Lemmings - the Bomber skill. Worms - the Kamikaze (most of the games), Suicide Bomber (a cheat in Worms 2, an actual - but nerfed - weapon in Worms Armageddon and Worms World Party) and Airburst (Worms 4 Mayhem) weapons. Chrome Dome in Teenage Mutant Ninja Turtles: Tournament Fighters has a super move where he self-destructs in a huge explosion. Fortunately, his pieces immediately come back together; his opponent isn't so lucky. Pariahs in Nexus Clash have this as their defining trait. The fact that they know they'll just wake up twelve hours later fully healed with their equipment banged up makes it a bit less of a sacrifice, though, so they really just tend to do it for laughs. Taken Up to Eleven in the latest version of the game, in which Pariahs now have a chance to explode any time they die, sacrifice or no. City of Heroes has the Embalmed of the Vahzilok, walking corpses made by a Mad Scientist and equipped with explosive backpacks. Also, some of the Circle of Thorns Mages will try to blow themselves up when critically low on Hit Points. In City of Villains, one power the Mastermind player characters can pick up in the Traps powerset lets them do this to their own minions. With the addition of the Cyborg purchasable add-on pack, players can now self destruct to cause a lot of damage. It is actually preferable to simply allowing the enemies to kill you, as Self Destruct circumvents the game's death penalty. Even though you don't die using it, one can consider any of the "nova" powers that Blasters, Corruptors, and Warshades get as they involve running into a mob and releasing all your power at once. NetHack has gas spores, which can only be dealt with in melee if you're at least level 3 or so, and even then it's very dangerous. Other enemies, such as Yellow Lights, blow up and give you status effects. The Tek War FPS (and corresponding novels) have android enemies that look just like normal civilians, except they explode when they touch you. Luckily you have a weapon that kills androids really quickly... at point-blank range. In the Star Control series Shofixti ships have a very weak main projectile weapon — and a very powerful self-destructive "Glory Device" as a secondary weapon. And in Star Control 2 the Shofixti are nearly extinct because they made their own sun go nova in order to destroy an invading Ur-Quan fleet. All that's left are one warrior who was out of the system at the time, and accidentally broke his Glory Device, and some cryogenically frozen females in a VUX admiral's collection. In Age of Wonders the main weapon of Goblin Bomber unit is a large Cartoon Bomb carried as a backpack. In the second game it has no other attacks and cannot even answer melee strike — only walks to the target and triggers wall-crushing explosion. One of items (looking like a Cartoon Bomb) gives a Hero or Wizard the same Self Destruct ability... and Resurgence. The Boomer zombies in Left 4 Dead (There's a clue in the name). Interestingly, the blast doesn't hurt anything, but it causes knockback and covers anyone nearby in bile that immediately attracts a horde of regular zombies. And blurs vision. Originally, Boomers were literal walking bombs where its exposion could cause major damage to the survivors. Seeing how play testers kept accidentally shooting the Boomer in close quarters and lost a chunk of their health, Valve decided to make the Boomer's death explosion cover survivors in "non harmful" bile instead. The purpose of the Boomer is not to be an Action Bomb, however. It's there to barf on you to attract the horde of normals... the Action Bomb mechanic is there to discourage killing them up close. Persona 4 has Teddie using a self-destruct attack to save the party from a seemingly-invincible boss. It leaves him flattened and disheveled, but he gets better. Persona 5: Alice's unique "Die For Me!" Special Attack involves an army of giant Killer Teddy Bears with bombs in their chests rushing the enemy before they explode. Star Wars: Galactic Battlegrounds features building-shredding Explosive Droids in one of the Rebel campaign missions. In the PlayStation game Wild9, one of your allies has the special ability to explode on contact with anything, repeatedly, with no ill effects. Naturally, you have to toss him into things to solve puzzles. There are a number of these throughout MOTHER series, usually in the "explodes up on defeat" variant. They're especially nasty in the first game, which lacks the rolling HP counter of future titles, meaning that you'll unavoidably take a large amount of damage if you decide to pick a fight with then. It also introduces the power robots and trees, who appear in every future game. Earthbound has two particularly annoying variants in the spheres and its take on the power robots. The former bombards you with powerful PSI attacks, while the latter can max out the HP of an ally each turn, which would normally make them top priority targets, if not for the usually fatal amount of damage they inflict to multiple characters upon death. Due to the aforementioned rolling HP counter, the damage can be reduced to a measly amount if they're defeated last. MOTHER 3 adds some voluntary exploders in the Squawking Boomstick and the Bomb Hugger; the former randomly deciding to explode whenever it wants to, and the latter exploding on a single character after a three turn countdown. In Mortal Kombat 3, one of Cyrax's fatalities was blowing himself up to take out his opponent. Then through some twist of logic, he is back to fight his next opponent. Even more baffling is Smoke, who blows up the whole planet. Cyrax has a similar Earth-Shattering Kaboom fatality in Mortal Kombat Gold on the Dreamcast. Cyber Sub-Zero in Mortal Kombat 9. The laser-proof Balloon Fish in UFO Aftermath, best known wherever hardened UFO Aftermath players gather to cry into their beer about the entire squad being wiped out by a One-Hit-Point Wonder who happened to be behind a door and they neglected to send off one "volunteer" to open said door. Smash TV featured Mr Shrapnel. He'd wander around, grunt if he was hit by a stray (or not so stray) bullet, stand still for a while, and detonate himself into a few examples of his namesake. One of the better examples on the page, since while he's wandering he's very low down on the player's threat level: You have other things to worry about. And then it stops, and suddenly you realise that you've been ignoring several of the most dangerous enemies in the game and they take a helluvalot of damage to kill safely before they explode all up your face. Gauntlet Legends had some enemies with an ominous red barrel and a fuse strapped to their back. The general warning was a suicidal scream before they charged you. The Poppers from X-COM: Apocalypse, small, blue, two-legged aliens whose one attack is to run up to your agents and explode with a huge blast radius. Very deadly in the early game. Oh, and they also explode if you kill them with explosive/incendiary weapons. Their explosion is slightly more powerful than the dedicated Heavy Explosive produced by Marsec. Said Heavy Explosive is essentially a Time Bomb used for demolition work, meaning it is also an Incredibly Obvious Bomb. Yep. inFAMOUS has kamikaze Mooks who run up to you and explode. Which you can hear coming from a mile away because they scream at the top of their lungs. The rats in Psychonauts, which not only damage you by exploding, but also release a cloud of confusion gas that temporarily screws with the game controls. There are also Personal Demons, tiny humanoids with huge heads that just explode. Age of Empires II: The Conquerors adds the Petard, a unit which does massive damage to buildings, but dies in the attempt. In the first Age of Empires, there are Demolition Ships and the Saboteurs that are only available in the last Genghis Khan campaign mission or via a Cheat Code. Flying Bombs were an enemy in Wario Land 1, with the rather annoying attack pattern of attaching to Wario's head, being difficult to remove and then exploding on a short timer. StarCraft I has Infested Terrans and Scourges. Starcraft II has banelings. The expansion to the second game lets you upgrade your Banelings during the campaign, either to explode and split into mini-banelings or to have the ability to jump over units. Survival Crisis Z has Dead Weight fat zombies, who explode like a grenade when killed. Best to keep your distance. One of the Ninjitsu in older Shinobi titles was the "Jitsu of Mijin", a self destruction attack that destroyed all onscreen enemies in exchange for a life from your stock. Musashi would reform himself right where he had been standing, unless the player was stupid enough to use it when no lives were left, in which case it would be Game Over. The aptly-named 'Splosion Man, who can normally detonate himself up to three times in a row before needing to recharge. League of Legends has Kog'Maw, whose unique passive ability is to not die when his health reaches zero, but instead become one of these, with a few seconds to run up to an enemy champion and do some damage (or even take them with him) as he self-destructs. Elise's Volatile Spiderling ability summons a spider that explodes in a blast of venom when it reaches a target. Shambles of the shivering isles add on for The Elder Scrolls IV: Oblivion trigger a area of effect frost spell upon dying. Yes, a frostplosion. Atronachs explode into a burst of their element when killed. Some higher level Dwarven Spiders emit a burst of shock when disabled. The summonable Flaming Familiar runs up to the nearest hostile entity and explodes. The Dragonborn DLC introduces the Albino Spider, the eggs of which can be combined with gemstones at a special machine to create special variants which, when thrown, will home in on the nearest lifeform and explode in various elemental alignments. Also introduced in Dragonborn is Ahzidal's Ring of Necromancy, which when worn makes all the wearer's reanimated undead explode for 50 points of frost damage immediately upon being struck. Some of the hobbes in Fable II have kegs of black powder strapped to their back, and will light them and run screaming towards you if they see you. Fortunately you can take them out from a distance with a spell or a ranged attack. The Nuclear Anomaly perk from the Broken Steel Expansion Pack for Fallout 3 allows you to channel your radiation poisoning level into a devastating shockwave when your health drops to 20 or less. You explode once every 10 seconds untill you get to over 20 HP. the Glowing One enemy can do this at will. You can make NPC's into these by planting explosives in their pockets. Spore Carriers in Fallout: New Vegas can do this, as do Robo-Scorpions from Old World Blues when killed, even after already being exploded or disintegrated. In one of the Boomers' quests, you have to clear the Nellis generator facility of exploding giant ants. If one goes off next to a piece of ordnance, it can cause the entire stockpile to detonate, blowing you and your companions to kingdom come. The Meltdown perk causes enemies to explode when killed with energy weapons, and can also cause chain reactions. Fallout 4 introduced the Super Mutant Suicider. His only weapon? A mini-nuke. His only method of attack? Taking you with him to hell! Mole Rats laden with frag mines are an occasional random encounter. Shooting a Power Armor's Fusion Core will cause a mini-nuke-sized explosion that instantly kills the wearer and anyone nearby. Assaultrons and Sentry Bots will self-detonate when critically damaged, and the Legendary variants always explode after defeat. Any Robot in the game will explode, after trying to close the distance with you, if you destroy its weaponry. Rachni workers in the first Mass Effect attack by bursting and spraying toxic fluid everywhere. Justified, as they're eusocial pseudo-insects, and eusocial organisms generally don't place a high value on the life of an individual — real-life eusocial insects have combat strategies that vary from "just as suicidal" to "slightly less suicidal". Mass Effect 2 has Abominations, modified husks who charge the player and then explode. Outpost 2 gives both factions Starflares and Plymouth Supernovas. They both sound far more impressive then they actually are. Overwatch: Junkrat is the "detonating death" variety; his "Total Mayhem" passive ability causes him to drop a bunch of grenades when he dies, damaging any opponents standing too close to him. His ultimate ability "Riptire" involves sending a remote-controlled, explosives-laden tire at his enemies. The Sonic the Hedgehog games for the Sega Genesis have a few enemies like this. Sonic the Hedgehog's Star Light Zone has bomb-shaped robots that lumber around for a few seconds before exploding, releasing four fireballs in the process. They get a size upgrade in Sonic CD. Sonic Erazor, a Game Mod for the former, has gray Bombs that can explode several times. Sonic and Knuckles has enemies in Lava Reef Zone who disguise themselves as rocks. When you get close, they lose their disguise, blink for a second, and explode, very much like the above example. The boss of Sonic Mania's Metallic Madness Act 2 has Dr. Robotnik piloting a machine that deploys different robots out of the glass pipes on the sides. Befitting the origin of the level, the pipe on the player's left deploys Amy Rose robots that grab onto the player or their AI partner and explode. The Amiga/C64 version of Impossamole has suicide bombers with dynamite strapped to their backs. ADOM has the elemental vortex. Its sole attack is to stand next to you and explode into a fire/ice/lightning/acid ball. Engage at range or not at all! They can't explode in the dark. All units in Total Annihilation can self-destruct, damaging nearby units. The Roach and Invader are tiny little bots that are specifically designed to self-destruct and produce explosions much bigger than their size would suggest. For bonus fun you can load a bunch of them into a sea transport ship and detonate that, or fly them into the enemy base with dropships. The Commander can also be used this way as a measure of last resort, provided the server settings allow you to continue playing after your Commander dies. The spin-off Total Annihilation: Kingdoms lacked the standardised self-destruct as the units were organic (it being a fantasy setting) but later added the Giant Rat unit for Taros, a giant rat with a barrel of magical explosive strapped to its back and the ability to turn invisible. Spiritual Successor Supreme Commander only has powerful death explosions for some units, while it took until the Forged Alliance expansion to add the Fire Beetle mobile bomb to the arsenal of one faction. However, some of the experimentals, most notoriously the Aeon Czar, will wipe out anything around them when destroyed. The Seraphim Ythotha then goes one better and leaves behind a quantum lighting orb thingy that fries nearby enemies when destroyed. The Czar doesn't just Action Bomb when destroyed, the hull wobbles down to earth and destroys anything it lands on as well! The Ythotha's orb was originally intended as a feature for the Galactic Colossus, but got Dummied Out until Forged Alliance came along. Painkiller had a zombie in the theatre level that carries a big barrel of gunpowder and runs toward you. Shooting the barrel makes im blow up his buddies. Not shooting the barrel... well, you just don't want to do that. This enemy from Mega Man 3. It's pretty much a grenade with legs. Mega Man 9 has intelligent water mines in Splash Woman's stage. Both System Shock games had them: The small robot bombs in the original and the Robot Buddies-like protocol droids in the sequel. The rover-like Scouts in Metal Arms: Glitch in the System, although they're smarter than usual by setting off an alarm and summoning reinforcements before suiciding. The later levels of the first Klonoa game (and its Wiimake) introduce bomb enemies that explode after being thrown. Several puzzles in these levels involve throwing them at just the right time. Metroid Prime 3: Corruption features two Action Bombs made by the Space Pirates. Crawlmines crawl around everywhere and explode when Samus shoots or touches them; Aeromines are floating robots that have energy shields and weak lasers, which explode if an enemy gets too close. Breath of Fire III has "Tankbots" that use sacrifice which hits all allies with a chance of inflicting all but one HP of damage. You're the Action Bomb in Every Extend, sacrificing a life with every attack. The challenge is to gain points rapidly enough to replace the lost lives. Dead Space pits you against an enemy with a large, fragile bulb in place of one arm. If it reaches you, it slams this against the floor, detonating it in a suicide attack. But if you cut it off in time, you can throw the bomb into a group of enemies. In Turok 2, the Endtrails have self-destruct mechanisms that they activate when critically injured. Phantom soldiers in Dynasty Warriors 6: Empires have a nasty habit of exploding when you attack them. In previous Empires games, your weapons would [[Intangibility pass right through them]]. In Ace Online, the Bomber B-Gears can become this when they access their Elite Skills (formerly Finish Move Skills). Their move, aptly named Big Boom, blowing itself up, in which the attack power is Cast from Hit Points. Since they can just respawn from the nearest map gate, dying itself is not usually a problem (notwithstanding the tiny SPI penalty for dying or rarely, the EXP penalty should the pilot is cash-strapped). The real problem is its (relatively) long cooldown of 30 minutes, when and where it should be used (because of the cooldown, it is only wisely used for anti-gatecamp measures or as last ditch anti-rush defense), and the possibility of being hit by an M-Gear's Power Nullifier skill (since being hit not only cancels the skill, but the bomber retains the cooldown). Armored Core for Answer has a unique version called Assault Armor. In the game, each NEXT is equipped with a Deflector Shield called Primal Armor, powered by Kojima Particles. In for Answer, these deflector shields can be weaponized and exploded outwards, hence the trope. While these will outright take out lesser enemies (such as your common tank, helis, MTs, and some weaker Normals), these won't do much to another NEXT, barring depleting their Primal Armor. The side effect of using this is that your own Primal Armor takes more time to recharge back and recharges slowly, while the opponent's can recharge back almost immediately. While it does take a chunk of Armor Points, and there are shoulder weapons that explicitly amplify Assault Armor usage (one of the opponent NEXTs you encounter uses exclusively Assault Armor), newer rebalanced Regulation has reduced its usefulness to somewhere between Awesome, but Impractical to Cool, But Inefficient. This might seem like a raw deal, but in exclusively Player Versus Player match, Assault Armors are still used for anti-rushers, since besides all that, a less-advertised effect includes "blinding" your opponents, preventing them to lock on to you for a specific amount of time. Minecraft has the Creeper, who's a standard version except for one annoying feature: being utterly silent until that burning fuse noise that translates to "you have about one second to live." The most annoying part isn't even dying: they do heavy damage to the landscape, including whatever structure you were working on. You might recover most of your tools and maybe your armor, but now there's a 20-foot hole where your beautiful house used to be. If a thunderbolt manages to strike a Creeper, it supercharges them, making their explosion attack even more deadly and the craters they leave behind are a lot bigger than a normal Creeper's explosion. As of the final version, creepers are by far the deadliest mob in the game, capable of inflicting a One-Hit Kill on players without armor on hard difficulty from a long distance, and even capable of one hitting players on easy difficulty at point blank range. Gears of War has several! The first game has Lambent Wretches who don't actively explode, but go ka-boom after they're killed, as well Nemacyst, who are more of Action Missile. The second game introduces Tickers, animals (roughly dog-sized) with bombs strapped to their backs who do exactly what's expected. Gears 3 takes it up a notch with Lambent versions of almost every preexisting enemy, as well as completely new, lambent-only foes, including the morphing Drudges and the mighty Lambent Berserker. Every game in the series allows you to melee with a grenade equipped to stick it to your enemies, turning them into Action Bombs against their will. Just make sure they don't take you down with them. The third game introduced a safer option: If you have an enemy taken as a meatshield, you can perform a "bag n' tag" by tagging the grenade to your meatshield and kicking them away from you, preferably towards several of their buddies. The player controls one of these in controversial Flash game Kaboom: The Suicide Bombing Game. Spore Galactic Adventures can have creatures do this. This is actually the only way for creatures to attack a captain that is using stealth. In the Game Mod Batman Doom, the Penguin's robotic Penguin Bombs are this. In the last boss fight with the Penguin, they keep spawning and coming at you from all sides while you're trying to deal with the boss. Ullapool Caber allows the Demoman to become a self-destructing character. It's a stick grenade used as a melee weapon. Whacking an enemy with it does a large amount of damage to them and anyone else nearby while taking out about half your health and sending you flying straight up in the air high enough that you'll usually take even more damage coming down. Combine it with the Chargin' Targe for a guaranteed melee Critical Hit, and you gain the ability to charge at high speeds, followed by an explosion that will probably wipe out anyone nearby, be they Scout or Heavy Weapons Guy. Alternatively, using Sticky Bombs to jump can turn you into a guided missile. A Soldier equipped with the Equalizer/Escape Plan can use a Taunt Attack that makes him rip a grenade from his bandolier and pull the pin. Everything that is close enough will receive 500 damage. He won't survive without the effects of an Ubercharge, though. Mann vs. Machine also introduced Sentry Busters, a large naval mine with a Demoman robot's lower torso. The game even describes them as "basically a bomb with legs". The Bionic Commando arcade game has kamikaze soldiers with explosive backpacks. The literal Demonic Spiders of Doom 3 have an explosive variant. The penultimate dungeon in Ys: The Ark of Napishtim has Cartoon Bomb-shaped enemies that ignite their fuse when they see you and inflate before exploding. Gaia Online MMORPG zOMG! spends the first two areas setting up the Fluff-type enemies as mildly annoying at worst and no real threat. Then you enter Zen Gardens and are greeted by Cherry Blossom Fluffs, which explode when aggravated for improbable amounts of damage. And they mob. Newcomers learn quickly not to harass the fluffs. The Typhoon augment in Deus Ex: Human Revolution lets the player become one of these. The Typhoon Explosive System solves problems. Especially if your problems are sheathed in weak, shreddable flesh. In the second mission of Contra: Shattered Soldier, you encounter rocket-riding mooks. The Savage in Hard Reset. It's an explosive, beachball-sized robot with two stubby legs that either runs up to you and explodes, or rolls itself towards you like a super-fast bowling ball... and explodes if it hits you. They explode if you kill them too, which can potentially start chain reactions. Heavy Weapon has the ICBM, Cruise Missile and Blimp enemies. ICBMs will rise up from the background and drop on certain parts of the screen, while the cruise missile will come in horizontally and turn downwards as soon as it goes over your tank. Thankfully, both of them do not explode with a huge blast radius. Blimps will detonate into multiple indestructible shots that rain on you when you defeat them. Outlaw Bombers from Oddworld: Stranger's Wrath. Plants vs. Zombies: For the plants' side, we have Cherry Bombs (hits a 3x3 radius), Potato Mines (kills the first zombie that steps on it), Doom Shrooms (a nuke) and Jalapenos (hits a line of zombies). The zombies have the Jack-In-The-Box zombie, who plays "Pop Goes the Weasel" on his box until it randomly blows himself up with any plants in a 3x3 radius. The second game adds Primal Potato Mine (hits a 3x3 radius), Ghost Pepper (haunts zombies, then explodes) Lava Guava (3x3 area, and leaves damaging lava behind) Grapeshot (3x3, and releases a Spread Shot of eight grapes) Escape Root (switches places with other plants, and explodes on contact with a zombie), Explode-o-nut (acts as a defensive wall, and explodes on defeat), Bombegranate (3x3 area, and leaves behind explosive seeds) and Hot Date (attracts zombies to him, and then explodes). In Evolva, Flame Parasites catch fire, and explode after a few seconds, when they're killed. Omega Defense Spawn in Descent 2 attack by explosive ramming. A few other enemies, as well as bosses, also deal explosive damage when killed. Dynamite-wielding enemies in Resident Evil 4 will do this if they grab you and you're too dumb to shake them off. Instant death, needless to say. In Dungeon Fighter Online, Mechanics can set up robots to walk into enemies and explode, and the Witch's high level skills have her set up large contraptions which explode at the end of the attack. In the Call of Duty / Modern Warfare series, mortally wounded enemies will sometimes pull a grenade as a last ditch move. Ditto for the later Medal of Honor games. Battletoads has the gray, electricity shooting robots inhabiting the Terra Tubes level. They will explode if you run into them, though you can still headbutt or punch them offscreen safely. Spiral Knights has bombies, armless little zombies with bombs for their heads. No points for guessing their plan of attack. In a small twist on the trope, they actually have a fair amount of health, so the easiest way to kill them is actually to trigger the explosion and then to either run away or push them away before they detonate. In Borderlands, psycho bandits will occasionally charge at you while carrying live hand grenades. Borderlands 2 not only has Suicide Psychos, who either pelt you with grenades or just run up to you and blow themselves (and you) up, but also self-destructing versions of the Loader Mecha-Mooks called EXP Loaders. DLC Character Krieg's final skill of his Bloodlust tree has it that whenever he kills an enemy they explode with whatever element they were killed with (non-elemental kills just has them do a regular explosion) as well as another perk that turns him into an action bomb upon death by dropping a grenade when his Fight For Your Life meter runs out, granting double exp if it kills something. Another skill, "Light the Fuse," replaces the Fight For Your Life crawl-around-with-a-gun state for him angrily throwing down his weapon and pulling out a giant bundle of lit dynamite. He will spend a few seconds as a Mad Bomber, throwing sticks of dynamite. Once the time runs out, he holds up the whole pack and blows himself up very impressively, with the caveat that if his attacks kill an enemy, even his final suicidal blast, he immediately returns to life on the spot and is back in the fight. Borderlands: The Pre-Sequel! lampshades the absurdity of having robots designed solely to self-destruct in the sidequest detailing the creation of the EXPLoaders. Tassiter: John, did you just... issue a patent for suicidal exploding robots? What the hell are you thinking?! Jack: That it would be awesome? "Gotta blow up a bad guy, GOTTA BLOW UP A BAD GUY!" Dungeon Defenders had Kobolds, monsters with dynamite strapped to their backs that charge at you when you approach or attack them, dealing damage to any group of defenses (or defenders) caught in their wake. Nitro Splicers in BioShock can self-destruct at low health, taking their loot with them. In BioShock Infinite, the Firemen will also set themselves up for a suicidal-explosion when low on health as well. Target Terror has dynamite-chested suicide bombers. Spider Bombs in Red Faction II. Pochi-class Human Tanks in War of the Human Tanks. They have zero attack range, but can destroy any units surrounding them (including friendlies). Dynamite Dux has two bomb enemies in one stage that act as Smart Bombs when attacked. In Vanquish, if a Gorgie is critically damaged but not destroyed, the torso will zoom towards Sam like a missile and explode, potentially killing him in one hit. Starting with Mission 1-6, there are the Jellyfish robots, which are basically walking mines, coming in small and large versions. Some Super Robot Wars titles have the "Self-Destruct" SP command that destroys a mech to deal damage to all surrounding units. It most often appears on Joke Character Boss Borot or Heero Yui, who's infamous for self-destructing mechs. Any time missiles appear as separate units, their sole attack is an enormous unavoidable explosion with range 1 that also destroys the missile. They'll use it as a counterattack, or against a unit sitting at the edge of their movement range. Paranautical Activity has the Baahmba and Blow Fish enemies. The Bursters from Desert Moon are similar to Runners, but they're faster and explode if they reach your engineers or if they are killed, killing any nearby engineers. The ship log describes them as "Faster, more aggressive... and suicidal." The African Warlords have the Demo Truck. Pieced together from old tanks and cars, and filled to the brim with dynamite. The Shogun Empire has a Kamikaze Attack as an army consumable, guess what it does. Something has an entire level dedicated to exploding enemies called Happy Explosions. In addition to the Bob-ombs, Something Else has the pink Bullet Birds, the red Bomb Boos and the dull red Yoshi Koopas explode. Get Off My Lawn has Glowflares. After a while, these enemies explode, causing heavy damage to the yard and possibly stunning the player in the process if he/she is in the blast radius. In Robopon 2, Riggs Construction members make their exits in...memorably explosive ways. Dynamite Hoverbizzles in Double Dragon Neon. In The Adventures of Lomax, there are walking barrel enemies who stop dead and explode after a brief moment if you get close. Exploder Exchikke, which is a flying enemy that will blow up in your proximity. The stronger variant will actively chase you and leaves poison clouds after it explodes. Gertar, which is a small seedling enemy that can latch onto you and explode if you don't quickly remove it. Desouck. Whenever you destroy it, it releases electric balls that bounce around. The strongest variant adds in a huge electric surge. The strongest version of Flier Inensi. They fly and drop bombs, and if they die, they will fall and explode. The spider-like Rankes in P.N.03 grab onto Vanessa before exploding. It's possible to make "Damsel Bombs" by attaching a sticky bomb onto a damsel and letting her run into hard to reach or just plain dangerous areas so she blows up whatever threat or obstacle was in your way. Of course, it's also possible to stick a bomb onto a damsel by accident by holding her and pressing the quick-throw button, so now you're left left holding a ticking time bomb that, incidentally, CAN follow you. Slightly risky in confined spaces. As far as enemies go, the Jungle areas have Fire Frogs, which are of the "detonates violently upon death" variation. When they take any damage, they'll explode after a few seconds' delay. In the HD version, Mantraps can eat them, but they'll still explode after a few seconds. The Tower Defense game Canterlot Siege has Queen Chrysalis's super power, which rains explosive Changelings over a target area. Chicken Warrior occasionally sent out "Hot Chickens" at you that would blow themselves up if they got to you, and would die in one hit otherwise. In The Breach, a mutant spider subtype has a massively fat arse, which explodes when it touches you. In A Blurred Line, Talan can absorb a Black Aura spell called Life for Strength late in the game. It essentially allows him to commit suicide for the sake of a highly damaging attack, but the game is so easy by this point that there's no need to bother. In Iron Gaia, Rovers Tier 1 Rage Move is Self-Destruct, which is one of the most powerful attacks in the game. It still leaves him with 1 HP point instead of destroying him, however. In the "Escape" ending, Rover self-destructs for real at the station's core, causing it to crash instead of landing safely. The game adaptation of Lord of the Rings: The Two Towers has many of them, though they are relegated to One Hitpoint Wonder status and their explosion doesn't kill the protagonist, even as it takes out most orcs around them. Teleroboxer has the fourth opponent, Bomkun. Compared to the rest of the cast, it's a really silly-looking robot. However, unlike all the other enemies, it displays a 50-second bomb on its chest, which is less than one round. If you fail to KO it in that time, it blows up, causing a One-Hit KO. Twisted Metal Black's Brimstone launches suicide bombers at opponents as a Special attack. Ori and the Blind Forest has rolling green enemies that explode when they collide with Ori, another enemy, or a wall. There are also exploding purple slimes that drop from the ceiling. In Shantae and the Pirate's Curse, one of the enemies found in the Abandoned Factory is a robot with a very bombastic death animation, in that it will go out in an explosion of massive, highly-damaging fireballs that travel a considerable distance. The weakest Mooks of Future Tactics strap dynamite to themselves and blow themselves to kingdom come as their basic attack. It's done in such a way that the first level is a cinch (you can survive being hit by every enemy to win the fight), the next level is an absolute frigging nightmare (a catapult hurls another mook into the level each stage), and the following levels are much easier since you're now facing mooks with guns. RWBY: Grimm Eclipse introduces a type of Grimm not featured in the source material. These being Creeps that blow themselves up when they get near a player. They're easily identified by the Sickly Green Glow on their spines, as opposed to the normal white of regular Creeps. Better get running when you see these coming for you because their explosions hurt. Boom Slimes in Slime Rancher have been known to suddenly explode. Not that this does any damage to themselves or any of the other slimes. This makes them rather hard to keep, as more than a few of them can cause chain reactions to launch themselves out of their pen or knock you out. The Talos Principle: One test obstacle is a black, floating mine that will charge at specific targets when they get within a certain radius, detonating on impact. They react not only to the player, but also wall-mounted turrets. Swarmers are bug-like creatures native to the planet of Ekkunar and the moon of Bliss. Those without shells lounge at their targets and explode. With shells however, they simply bite at their targets instead which is otherwise negligible except when they come in large numbers. Swollen Swarmers are capable of exploding as well but only when they've sustained enough damage. Primal Thrall Bombers are Thralls equipped with bombs on their backs and are basically suicide bombers. Unless the bombs they're carrying are directly hit, the bombs simply fall off when the Thralls are killed. M1.Boom Bots are armless stoplight looking minions that act as waddling bombs that charge at enemies. When they come near an enemy, they plant themselves; turn their green lights to red; and make a distinctive sound before detonating. Bomb King's King Bomb ultimate from Paladins turns himself into one. Unlike most examples of this trope, the Bomb King survives blowing himself up. Ying can also turn her illusions into these using her Shatter ability. Units with Self-Destruct in Calculords. When destroyed, they deal between 2 and 4 damage to everything, potentially including your own units and base, in a wide area. Except for the Plasma Saboteurs, they all have high Attack power but just 1 HP, meaning they die as soon as they're damaged. Cpl. Krak loves the Section Eighter card in particular and deploys them almost exclusively in her middle lane. Suicidal Mooks, enemies with dynamite vests that run at the player, are the first encountered instance of this trope. Two aliens, Screechers and Banelings, are a more dangerous reskin of the Suicidal Mook. They attack the player by dive-bombing them or rolling at them at high speeds, respectively. There are multiple demons that fit this role. The first, Engorged Mooks, behave similarly to Suicidal Mooks but can throw themselves in the air. Lost Souls are similar to Screechers, but can track the player mid-fight and accelerate very quickly. Soul Catchers are large zombies that explode upon nearing the player, but the catch is that they explode into five Lost Souls. Yeah. Macbrover will, if ordered to throw dynamite (his standard attack) when within knifing range of an enemy, stick it on the enemy instead, and the mook will proceed to run around until he blows up. He will also automatically stick dynamite to any mook that he throws. Shrapnels and Boom Boxes in Banjo-Kazooie. Kao The Kangaroo: Round 2 has an enemy who's a dynamite stick on legs and who chases after Kao until he hits something. In Colobot, when spiders spot the player's units, they will charge at them and explode on contact. In Subnautica, we get the Crash Fish, which apparently eat sulfuric compounds secreted by the symbiotic plant species in which they live. When the player approaches those plants, the crash fish attacks while howling and ignites their ingested sulfur to explode. Several enemies in The Swindle will explode under certain circumstances. The penny-farthing robots and square mechs will explode on death or if you get too close, while the mini-zeppelins will pursue the sound you make and explode on contact with a surface - which can do anything from cause you serious trouble to make getting in the front door a little bit easier. Prismata has multiple units that sacrifice themselves to deal additional damage. The Ooma jellyfish in Fog Canyon have an explosive core that homes in on the Knight after they are struck, and deals double damage, as with most explosions. The Belflies' sole attack is to divebomb the Knight and explode on impact. Most of the tougher enemy types that appear after the Forgotten Crossroads becomes Infected explode shortly after being killed. A number of enemies will run up to you and explode, notably the witch Alira's bandit minions. Some enemies explode when killed, either because of their creature type or because they possess the "volatile" or " frost/fire/storm bearer" mods. The first once caused them to explode immediately for colossal damage, but because this disadvantaged melee builds was eventually changed into them spawning a bomb that chases the player. The second causes each enemy in a pack to drop a bomb on the ground that covers a much larger area. One or two enemies explode when reduced to "low life", and the player can grant this ability to all of their minions with the Minion Instability skill node. For a long time this was difficult to utilize consistently (as it required minions to be severely damaged but not killed outright), but eventually a unique item was introduced which caused the player's skeletons to rapidly burn to death, as well as the Dark Pact spell, which damaged skeletons to hurt nearby enemies. Kingdom Hearts II has the Minute Bomb, a small Heartless with a shell that resembles a stereotypical bomb. True to form, their main method of attack is to blow themselves up. Casting Fire magic on one will cause it to detonate immediately. 358/2 Days also features them along with a few stronger variants, including the icy Skater Bomb and the Storm Bomb, whose explosion creates a whirlwind. Andy the bomb from Red vs. Blue is eternally frustrated that he's never able to fulfill his purpose. Sadly, he appears to not be able to perform. In Girlchan in Paradise! !, one character detonates himself using his most powerful (and apparently only) technique. He then proceeds to be poorly edited in so that he isn't dead. The Mine Turtle from the ASDF Movie series. Zeeky H. Bomb from The Demented Cartoon Movie plays with the trope; he doesn't actually explode, but he does cause nucularnote It's pronounced "nuclear"! explosions at his location by saying "zeeky boogy doog". DSBT InsaniT: Seth can summon toy biplanes to kamakazie into opponents. Schlock Mercenary, probably as a Shout-Out to the Voyager/TNG example above, features former Ambassador Ch'vorthq. Ch'vorthq is a genetically engineered bomb, set to go off at a meeting between the Creethlings (for whom he is the nominal ambassador) and the Golbwerians, killing the Golbwerian diplomats and allowing the Creethlings to attack in force. He's disarmed before he can do any actual damage. Unusually, Ch'vorthq doesn't know he's a bomb; he thinks he's a legitimate diplomat, and is horrified to discover that his employers/designers didn't actually want him to make peace. However, the 'disarmament' only stoped him from being forcibly detonated - he could still blow himself up at will. Or, rather, (since he's ugly, not crazy), setting a part of his anatomy on a short fuse and throwing it. After losing both his arms and one eye that way he retreated to the background for several years before an emotional crisis set off an irreversible chain reaction that caused everything but his brain (removed and stored in a jar in time) to detonate. Agatha's Dingbots in Girl Genius has the ability to do this, a rather uncomfortable fact that the Baron's army learned when they found themselves fighting several swarms of them. In Sluggy Freelance Bun-Bun uses this tactic during his last fight with Blacksoul:You're not taking me with you. I'm taking you with me." Ran in Bob and George is built of shoddy Soviet materials, and breaks so often (and is made so cheaply) that his creator simply set a machine to automatically download his memory and personality into a new body and teleport it back to the location of the previous one when he dies. Result, when the heroes are facing an army of Robot Masters? Ran Bombs! Nuclear Dan's entire strategy in Another Gaming Comic is to do this. Subverted in that he's normally immune to fire, but justified that any time he isn't, he still does it. It is surprisingly effective. Clubs Deuce attempts to invoke this during the Midnight Crew intermission in Homestuck, by running around with a hat full of bomb and a head full of empty. It manages to terrify Fin, but not Stitch, because C4 is a stable explosive and thus unlikely to detonate with gunfire. In El Goonish Shive, Damien turned himself into this in order to kill Grace. Awful Hospital: Seriously The Worst Ever brings us the Molly Juniors, biohazardous medical waste bags filled with everything you would expect a medical waste bag to be filled with. And also used needles, which shouldn't be stored in a plastic bag, but, well, look at the webcomic's title. Whenever a Molly Junior sees something that shouldn't be where it is, it runs toward it and explodes, spraying contaminated blood and needles everywhere. Eventually, we get to communicate with one via the Eyeslob, which gives us something of an insight into their explosion-related Blue and Orange Morality. Molly Junior: Well, sure, but I'm not being much of a friend if I still haven't exploded you. In Pokémon Apokélypse, a Voltorb is used to blow up a car. In Noob, neogicians have a kamikaze ability. At one point the superhero guide How To Hero mentions an anthropomorphic nuclear bomb as the kind of supervillain a superhero might find themselves fighting. Making Fiends has the exploding pigeon fiends in "Mama Vendetta". Naturally, they proceeded to follow Vendetta everywhere they went after they hatched, thinking that she's their mommy. This is the main/only attack of Grenader from Skysurfer Strike Force. It's 'OK' though, he's a Robot, and he reforms shortly afterwards. Many of the slugs in Slugterra have some effect that involves blowing up. Particularly Grenukers. Sym-Bionic Titan has the Ridiculously Cute Critter, Tashy 497. Starscream of Transformers Animated once used two decoy clones as bombs that began a countdown to detonation after they were captured and placed in close proximity. The Venture Bros. had the Goliath Serum, which turns any living thing into an explosive. Hank had a brief bout with it in "Ice Station Impossible!" Western Animation/Ninjago: In the finale of Ninjago:Rebooted, Zane, an Android, blows up his power source to destroy the main villain, The Overlord. The Kamikazes of World War II and the terrorists that carried out the 9/11 attacks, both of which involved deliberately crashing planes with people in them into what they wanted to destroy (though the kamikaze pilots were alone). Suicide bombers, who kill people by detonating explosive-filled vests, usually against nonmilitary targets. The Russians trained dogs to dash to the nearest tank and crawl under it. Then they wired the poor mutts with pressure-triggered explosives. Although it must be noted that their first batch of dogs was trained using Russian Tanks. Guess what happened on the first battlefield trial. They did better in the Crimean War, training pigeons to fly to men wearing red jackets, and attaching black-powder grenades to them. There were also variants of Kamikaze: aside from damaged planes or pilots with the initiative to do this on their own, the "cherry blossom" (ohka) rocket-propelled plane and the kaiten manned torpedoes were designed explicitly for this purpose, with no additional armaments or autonomous capacity, and once the pilot was seated in the cockpit, it was impossible for him to get out. In the same vein, a group of German fighter pilots in WWII would ram their planes into American and British bombers. Typically the pilot tried to survive the crash, so they'd aim to cause damage like shear off wings or tails. The technique was developed after one pilot accidentally steered his stricken fighter into a bomber and destroyed it. The first documented rammings on the Eastern front occurred on June 22, 1941, less than an hour after first bombings of Kiev and Minsk. Russian fighters were out of ammo and often on fire. Another desperate example form Soviet-German front. Some soldiers would tie anti-tank mines to themselves and lie under approaching tank tracks. Late in World War II, American military researchers hatched an ambitious plan to release massive numbers of bats over the industrial cities of Japan; the bats would descend upon countless buildings and roost in hard-to-reach places. As each bat was to be equipped with a small incendiary device, it was predicted that the result would be widespread, uncontrollable firestorms and a devastating final blow to the Japanese war machine. The program was taken very seriously and preliminary testing showed promising results, but plans to outfit millions of bats with bombs were scrapped when a more definitive solution became available. Yet it worked—for a given value of worked. The bats certainly did what they were expected to (went and roosted someplace), but failed to do what they were supposed to (roost in something with military importance). Bats would either suffocate or freeze to death during any trip to an actual target, and it wasn't exactly an improvement over conventional incendiaries that didn't require the military to breed and care for hundreds of bats. It's a remake of a trick from a 10th century Russian epic: the newly widowednote the husband had it coming with his taxes princess Olga is persuaded to stop her Roaring Rampage of Revenge and even would consider marrying her husband's murderer if her foes will give her some nominal tribute... say, three pigeons and three sparrows per household? They wonder how forgiving she is... until the next night, when the birds returned to their dry straw nests—with fuses. The brander, or fireship. A small sailing vessel laden full of explosives, tar and gunpowder, and manned with a skeleton crew. The idea of a fireship is to sail it next to an enemy flotilla, preferably at night when it cannot be seen until too late, and then jam the rudder once the bearing is set. The crew then sets the ship alight and exits with a dinghy. When used correctly, they were literally devastatingly effective, being able to set several enemy ships into fire at once. The Royal Navy especially became known for its skillful use of fireships. Even when they didn't succeed in setting the enemy on fire, they certainly caused panic and confusion in the enemy ranks, as ships would break off attacks, fall out of formation, and even crash into one another trying to avoid the dreaded blaze. Even as late as WWII Britain used the fireship idea with a modern twist, packing the obsolete destroyer HMS Campbeltown with 4 tons of high explosive and sending it on an operation to take out the only German-held drydock in all of the French coastline capable of servicing the battleship Tirpitz, in Saint-Nazaire. Loaded with commandos and coming in the dead of night, it charged full tilt through coastal gunfire and rammed into the drydock gates so hard it rode up and nearly through them entirely. After a fierce battle with the commandos destroying the machinery to operate the dock gates, and either dying, being captured, or escaping back to England, the Germans began mopping up the damage as best they could the next day after all was said and done. Except for the matter of the bomb onboard the destroyer which they were completely unaware of up until it exploded at about noon, taking out about 360 men and what was left of the drydock, putting it completely out of commission for the rest of the war and even 5 years beyond that. The ancients as far back as the Greeks in 400 BC used fire ships as a tactic against massed fleets of wooden sailing ships. Not a bad choice since the flammables could easily spread from one burning ship to another, or alternately, a large, valuable warship could be destroyed by a dinky little boat full of lit oil. The Chinese added gunpowder to their boats, turning them into true sailing explosives. The most notable instance of such a tactic working was at Red Cliff, where Wu's explosive fire boat attack crippled Cao Cao's massed, chain-linked navy. The sacrifice of one cheap, old ship (and just as often its crew) to destroy one or more functional warships was considered a worthwhile trade. A potentially viable modern strategy is to load a ship with missiles and plow it into a carrier group to overload the defenses of the group. The ship won't survive and it would not be a cheap endeavor but carriers are expensive and valuable. The US military strongly considered doing this with nukes. The first time was during the Crossroads test at Bikini atoll after the first air dropped nuke did not do a lot of damage to target ships. A second one was detonated underwater hanging from a repurposed landing craft. Next when the hydrogen bomb came around, designs were too big to fit on airplanes, so a suicide ship was to be designed if aerial deployed designs didn't pan out. Many hydrogen bombs were tested on moored barges, mostly for cheapness and safety, but some military engineers figured similar barges could be used to deny large swaths of the sea to an enemy navy. Some real-life ants and termites actually do this. It's called Autothysis .